notification is released through Chhattisgarh Vyapam for the recruitment of DEO, Assistant Grade 3 and other posts. And all the recruitment process will be under this Chhattisgarh Vyapam only. The eligible candidates have to submit the online applications through the official website of the Chhattisgarh Vyapam @www.cgvyapam.choice.gov.in. Last date for submission of application online is 25-January-2018. To recruit all these vacancies a common written test will be conducted by Chhattisgarh Vyapam Board for Assistant Grade III and other posts..
Click here to see the official notification of Chhattisgarh VYAPAM Assistant Grade III Examination. There are total 101 vacancies available in Chhattisgarh VYAPAM. For all the posts the candidates must have qualified intermediate or 10+2 from a authorized board of Chhattisgarh. All the candidates must have the typing knowledge on computer with speed and accuracy. As on 01-01-2018 minimum age limit for Unreserved candidates is 18 years and maximum age limit is 35 years. For all the other candidates including female upper age limit is 45 years. To recruit the available vacancies in Chhattisgarh government a common written test will be conducted by CG Vyapam Board. The written test will be consists of 200 Marks with 3 hours of duration. There is 1/4 negative marks for each wrong answer. 1. General Studies: Fifty questions will be given from this section having 50 marks. 2. General Mental Ability: This section will be having for 30 marks with 30 questions. 3. Basic Computer Knowledge: This section will be having for 30 marks with 30 questions. 6. General English: This section will be having for 20 marks with 20 questions. Those who are qualified in the written test, based on merit list those candidates will be called for the personal interview. 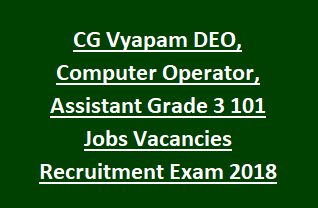 To fill the application form online the candidates has to open the www.cgvyapam.choice.gov.in website and click on online application for the post which you are going to apply. The candidates have to fill the application through online only. Offline mode will not be accepted. Upload the photo and signature and fill the necessary fields. For exam application payment options please see the official notification. Click here to apply online for the posts of Stenographer, Computer Operator, Assistant Grade III and Data Entry Operator. Please share this Chhattisgarh Vyapam Assistant Grade III Vacancies examination 2018 article to your beloved friends through digital media.